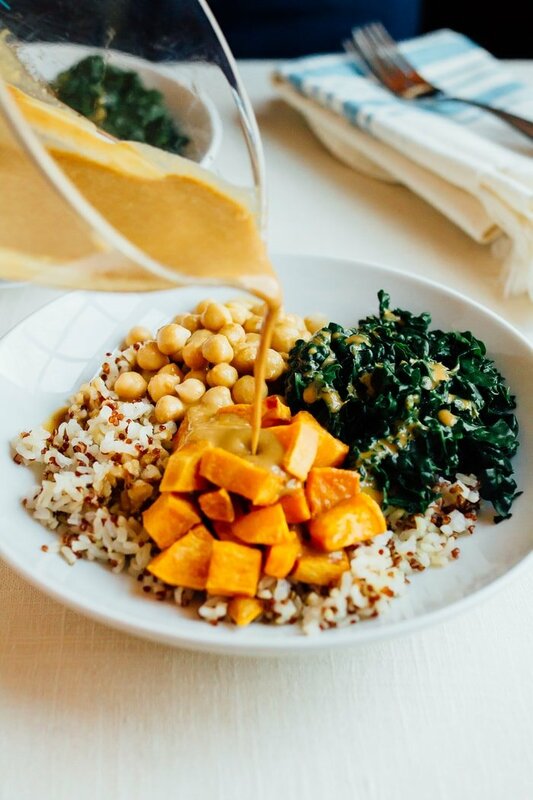 Make yourself this crazy delicious vegan brown rice bowl with roasted sweet potatoes, kale and chickpeas all coated in a savory peanut sauce. 18 grams of protein and 20 grams of fiber per bowl! I can’t believe that I forgot to post this little gem earlier in the week because it’s one of the best dinners I’ve made in a while. And it’s awesome because it’s one of those meals that comes together so quickly if you prep your ingredients ahead of time. The funny thing is that I wasn’t planning on creating a recipe. I simply got hungry while meal prepping last weekend, tossed a bunch of things I’d prepped in a bowl and this little meal was created. As it turns out the brown rice bowl was absolutely delicious — I loved it so much I ended up having the same meal for lunch and dinner the next day. You never know what a night of meal prepping will bring to fruition. Brown rice: Make a big batch on the stove for the week or keep it simple and buy frozen brown rice. Whole Foods, Trader Joe’s and Kroger all see frozen options that cook up in less than 10 mins. You can use cauliflower rice if you’d like a grain-free option. I ended up using a brown rice and quinoa blend. Chickpeas: Cook your own or use canned if you’re in a rush. I cooked a big batch of chickpeas in my pressure cooker, which only took only 11 minutes. Sweet potatoes: Chop 1 large sweet potato into 1/4 inch chunks, drizzle 1 teaspoon of oil and sprinkle with a little sea salt. Bake at 400° F for 30 minutes. This step can be done ahead of time. Check out my coconut oil roasted sweet potatoes if you want to make a larger batch of sweet potatoes as part of your meal prep. Kale: De-stem, wash and chop kale. Then steam in a steamer basket for 3-5 mins or until tender. You can also blanch or sauté the kale if you’d rather. What we LOVE about this brown rice bowl is that it is sooo easy and versatile. You could totally add or switch up ingredients and it would still taste lovely. 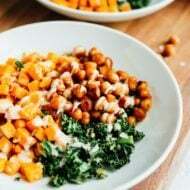 Although, I must say that the blend of kale, chickpeas, sweet potatoes and peanut sauce is amazing and makes for a lovely, protein-packed plant-based meal! I might even suggest playing a little with it. I have a page of the other Healthy Homemade Salad Dressings. 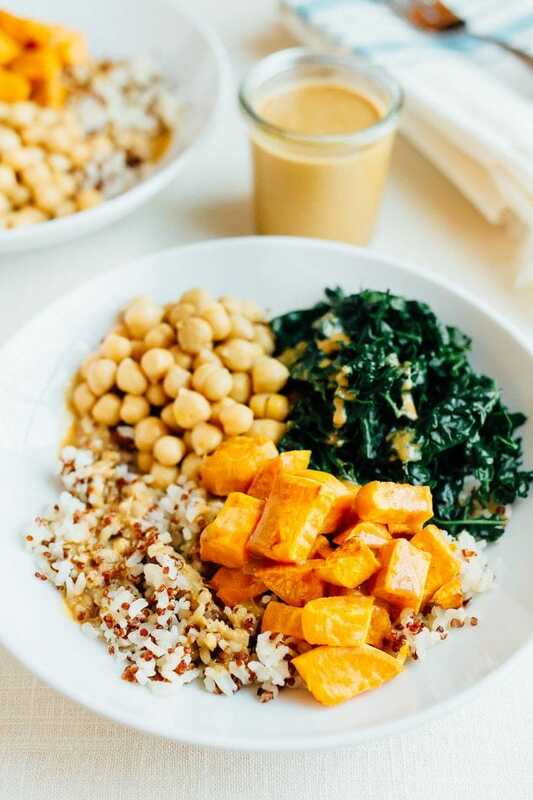 This delicious meal combines roasted sweet potatoes, kale, chickpeas and brown rice for the ultimate meal-prep bowl. Everything can be prepped ahead of time to make assembly a breeze. Serve warm or at room-temp. Roast sweet potatoes if you haven’t already. Chop 1 large sweet potato into 1/4 inch chunks, drizzle 1 teaspoon of oil and sprinkle with a little sea salt. Bake at 400° F for 30 minutes. This step is best done ahead of time. Cook brown rice according to package instructions while sweet potatoes are roasting. Prepare kale by washing, de-stemming and chopping. Then steam in a steamer basket for 3-5 mins or until tender. You can blanch or sauté the kale if you’d rather. Make peanut sauce by blending all the sauce ingredients in a blender until smooth. Add water to thin sauce and create desired consistency. 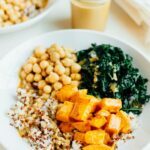 Once all ingredients are prepped, grab two bowls and evenly distribute brown rice, kale, chickpeas and sweet potato chunks between both. Drizzle each with as much peanut sauce as you’d like. Serve warm or at room-temp. Everything in this bowl can be made 2-3 days in advance. Just reheat the rice, kale and sweet potato chunks before serving. Toss with chickpeas and peanut sauce and enjoy. yum, these are so many of my favorite foods, in one! That looks so tasty! Your pictures are fantastic, too! Yum – I love greens with warm sweet potatoes or butternut squash. Love that peanut sauce, Britt…seriously going to make that tomorrow. Have a great Easter! xoxo Miss you and Love ya. This bowl looks incredible. I need to make more rice bowls, you’re right they are so easy and versatile. that brown rice bowl looks awesome!!! oh! i love kale & sweet potato! during thanksgiving i add steamed kale to smooshed sweet potatoes & lightly cooked cranberries. it’s sweet, savory & tart! can’t wait to try adding your recipe now! I love when recipes are completely accidental. Your bowl looks fantastic! I’m pretty sure I’ve never met a brown rice/garbanzo bean combination I didn’t like! I love peanut sauces too – totally sweet and savory – this looks totally delicious! Thanks for posting the sauce recipe! Ooh, this sounds really good! WOW, made this recipe last week after keeping it up on the computer for about 3 weeks (should have made it when I first saw it!) . It is to die for and my families new fav!!!! Thx Thx Thx!!! I’m so glad you enjoyed it Tamara! Made this tonight for dinner and it was AMAZING!!! So delicious! I made it exactly as you but choose to garnish it with a small handful of peanuts. My fiance and I are vegan and I love seeing that you have many recipes we can use. You should really consider writing a cookbook, I would buy it just because this Kale & Sweet Potato Rice Bowl was so freaking good! YUM!!! Made this peanut sauce this afternoon! I used sun-nut butter instead and apple cider vinegar instead of rice vinegar. I also added in some chopped green onion. So delicious! I could put this (and intend to) on everything! So glad you liked the peanut sauce Emily. I definitely put it on anything and everything!! Hello! 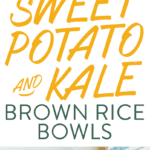 I’m trying to convert over to a Macrobiotic diet, came across your website in my hours of googling what I can eat and not feel like life is over…… I just made the kale sweet potato & brown rice bowl! OMG….amazing!! I substituted Almond Butter instead of Peanut Butter…. Did I say I thought life was over?!? If food with this diet is this good, life has JUST begun! This looks great. I have all the ingredients to make this. I will try it soon. Thank you! This was really wonderful! My family is not always easy when it comes to dinner and this was a huge hit!! Definitely making this again and spreading the word… Thank you!! This is such an amazing looking recipe, but I totaled up the calories and there are approximately 1225 calories! The peanut sauce alone has 852 calories! 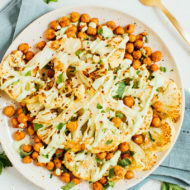 I could easily eat half this recipe for a quick dinner (the whole thing if I’m really hungry) but I can’t do 425 calories of peanut sauce, much less 852! I really want to try it because the other ingredients are so healthy!! Can you think of some viable, low calorie peanut sauce substitutions that would make it just as tasty? 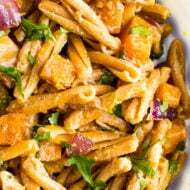 Recipe looks great even for a non-vegetarian! Can’t wait to see others. I googled a recipe that I could use sweet potato and brown rice and I’m so glad I found this. Wow!! It’s still cooking, waiting for it to finish but..it has been so easy to make and I tasted the sauce and its so yummy!! People say I eat like a bird…and now I really do 🙂 Yum! Thanks for the great recipe. Can’t wait to put it all together and enjoy. Yay! I hope you loved it. Hi, I’m going to LOVE this! Do you peel the sweet potatoes when you make this, or skins on? Thanks! And thank you sooo much for thia recipe. Cannot wait to make! brown rice syrup has high levels of arsenic! be careful when using. other substitutes include maple syrup, honey, molasses, agave, etc. Yum! 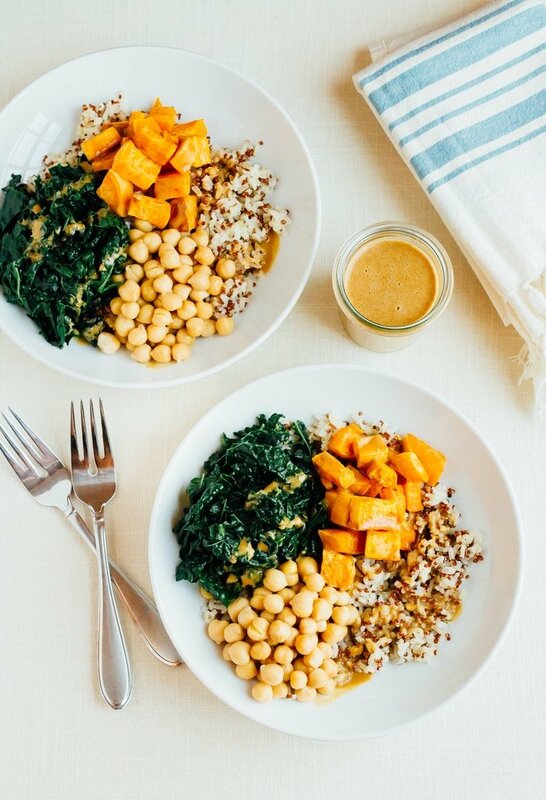 The sweet potatoes, kale, and chickpeas sound like they’d go great with the peanut sauce. I’ll definitely try this recipe next week. Thanks for the reminder about this recipe! I used to make it all the time but I haven’t in forever. I must fix that! It’s perfect for weekday lunches. Yay!! I loved making it this week as a reminder to myself. So glad you’re a big fan too. Thanks, Amanda!! I’ve been in need of real food since I’ve had my fair share of sweets, so this rice bowl is just what I’m looking for! Simple, filling yet flavorful! I made this for tonight’s dinner, I didn’t take a photo, but it turned out great and it was delicious!! Looks super delicious and easy. Thanks for the tips for early prep. I need to do more of this. Also, yay protein!!! I have to add this to my lunch plans this week! Delicious! Perfect for lunch or dinner! Love simple, surprising meals like this! I’m such a sucker for sweet potatoes AND peanut sauce — fab! I was a little skeptical at first, but OMGOSH! So yummy! Even my two year old over it. So quick and easy! I am LOVING the 7 day clean eating so far and only on day one. Super pumped for tomorrow. I meant he loved it! Are the quantities in this peanut sauce recipe the same as in the original post? Every time I’ve made it before the peanut sauce was quite thick and fairly pale, and since the re-do of the post, it’s quite runny and dark. My brain is telling me it used to be 3/4 cup of peanut butter. Yes/No? All of the ingredients compliment each other and the peanut sauce elevates the dish. The sauce is so good, I plan on using it on other bowls/salads. This is a hearty, filling bowl and easy to make. This recipe is unreal. SUPER tasty and easy to prepare. Definitely going to be a staple in our house from now on!! !